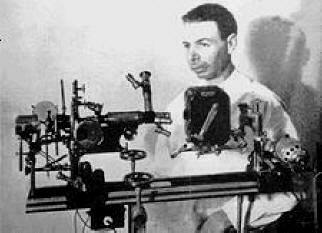 The microscope he invented while in Chicago working at Northwestern University Medical School was one of a kind. It was able to magnify at a maximum of 17,000 diameters and at a minimum of 5,000 diameters. 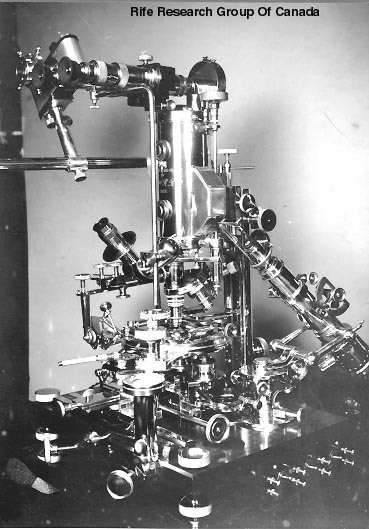 The strongest microscope at this time (1920’s - 1930’s) would only be able to magnify at a maximum of 2,000-2,500 times, which didn’t allow Rife to view certain micro-organisms. Without being able to view and study certain micro-organisms, it was impossible to work on curing certain diseases. However, he was able to build such a powerful microscope due to a rearrangement of lenses and by introducing double quartz prisms and illuminating lights to be able to “tune in” and pick up on the different colors extremely small micro-organisms naturally release at certain frequencies. This process substituted “staining,” which is what a scientist will normally do to view a certain molecule by introducing a color dye. Since the micro-organisms Rife needed to study were too small to “stain,” he capitalized on a principal that every molecule oscillates at its own distinct frequency. He was able to tune his microscope into those frequencies by emitting a light and could depict certain micro-organisms from their color against a black and white background. 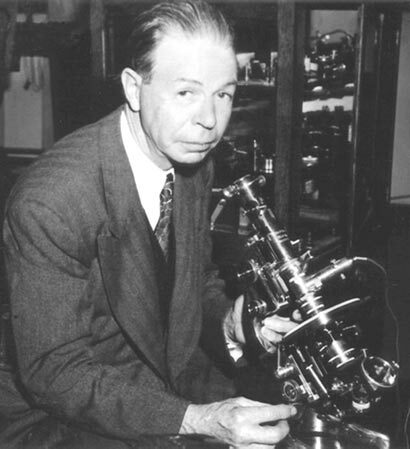 He first was able to single out and view for the first time the micro-organisms that caused tuberculosis, cancer, polio, and eventually AIDS. 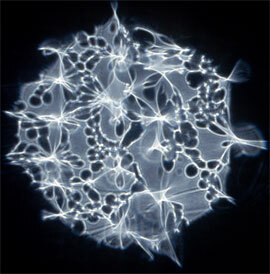 Rife later realized that specific electromagnetic frequencies would have a negative effect on specific bacterial forms. This is because everything on this planet vibrates at a certain frequency to form an electromagnetic bond with other molecules. Each bond between two different types of molecules is different like a signature. This is what allows an opera singer to hit a specific note and shatter a glass, but not break anything else around it. This means Rife would be able to send an electromagnetic frequency (a sound/radio/light wave essentially) at the specific resonate frequency of a bacterial and cause it to break down while not affecting any of the cells around it at all. In other words, a harmless procedure that could cure any disease has just been discovered. "With the frequency instrument treatment, no tissue is destroyed no pain is felt, no noise is audible, and no sensation is noticed. A tube lights up and 4 minutes later the treatment is completed. The virus or bacteria is destroyed and the body then recovers itself naturally from the toxic effect of the virus or bacteria. Several diseases may be treated simultaneously." One report was of a man receiving treatment that was so thin due to the cancer that “his backbone and his belly were just about touching each other.” After receiving treatment during those 6 weeks- 2 months, he completely recovered and was gaining all his weight back. Also, an additional 6 weeks after the first 14 patients were cured; the remaining 2 patients were then cured, yielding a 100% cure rate. To read more please click here.